Visiting my paternal grandparents when I was little always felt a little like visiting a museum. They had lived and traveled all over the world, my uncle was born in India, they were both US Navy veterans and voracious readers. There were a lot of bookshelves in their house, row after row, and on the space left sat souvenirs from their travels, including rocks and minerals, always dust free and sparkling. I loved the colors and textures. As I got older and my interest in minerals grew my Grandfather, a retired geologist and attorney, began passing some of his collection on to me. I can’t remember how old I was when he gave me a chunk of petrified wood the size of my hand, cut on one end and polished smooth as glass to show warm brown rings in various shades. It's beautiful, so different from the intense purple amethysts or pale yellow orange of citrine. Getting to visit Petrified Forest National Park has been on my bucket list of places since holding that stone for the first time. Darrell and I arrived a on a Sunday evening an hour before the park closed. It was the last stop on our first epic road trip together and we still had an eleven hour drive home ahead of us, but we couldn't pass up the chance to visit. The Ranger at the south entrance was one of the nicest we've met so far. He noticed that we had a receipt from the Grand Canyon and Saguaro National Park taped to the windshield still and convinced us that getting the yearly National Park Pass was a good idea. We'd visited four national parks in three days and it absolutely paid for itself. We've gotten one every year since and it's always a great investment. He also gave us some good advice about the spots to see with our limited time. 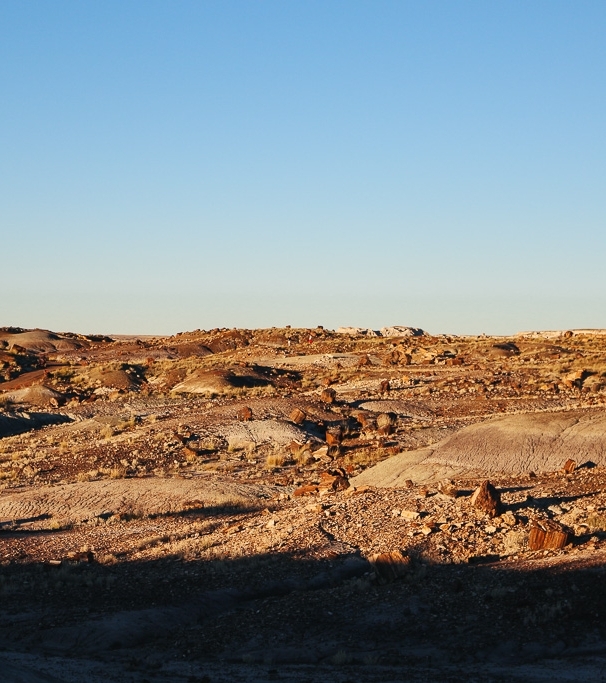 Petrified Forest, covering over 218,000 acres, was declared a national monument in 1906 by Theodore Roosevelt and created a national park in 1962 to protect not only the geological history but the archaeological as well. Petrified wood, technically Araucarioxylon arizonicum, in this area is almost solid quartz and formed millions of years ago when the trees were buried in river debris. There are giant petrified logs everywhere, some of them huge, broken into sections or tumbled together. Taking pieces within the park boundries is prohibited by the way but the park protects only 20% of the petrified wood in northeastern Arizona. There's lots for sale in gift shops all over. We stopped at Crystal Forest, a short loop through an area with tons of petrified wood and the best place to see it up close, and Agate Bridge. The later is an unbroken log, now supported with concrete to keep it from breaking, that spans a crevice. We pulled to the side of the road a few times to get shots of the landscape, the painted hills and rock formations were beautiful. The sun set at we drove, following the one way road through the park, sharing the desert with a few coyotes and swallows.